Moroccan cuisine is rich with influences that betray the country’s history as a strategically important place, with distinct Arabic influences laid over more obvious North African traits. There’s also Moorish and European influence in there, too, pointing to Morocco’s closeness to Spain, and its position as a gateway to southern Europe. The tagine is emblematic of the nation’s food. It’s a versatile, one pot dish, cooked slowly and gently to give the spices time to deliver their punch and the meat time to melt and tenderise. Tagines take time to cook, but are quick to prepare…short bursts of activity punctuate long periods of watching a slowly bubbling pot. The process is very rewarding, as you watch an unpromising pile of ingredients blend themselves together into a sublime dish. This version uses beef. Any stewing cut will do, but shin is the tastiest and best suited to sturdy flavours and long cooking. Chop 600g of shin beef up into bite sized pieces and add a spice rub made from a level tablespoon each of ras-el hanout, ground cumin, ground cinnamon, ground ginger and sweet paprika, seasoned with salt and black pepper. Toss the beef around to make sure that the spices completely cover it. Cover the meat and leave it in the fridge for a few hours, overnight if possible. Ras-el hanout is a mysterious ingredient. It’s best likened to a garam massala, although in taste and composition it’s completely different. No two ras-el hanouts are the same, but they’re fundamentally a mix of cardamon, cloves, cinnamon, cayenne, cumin, coriander, nutmeg and the like. Some mixes have over a hundred ingredients. My packet was marked as one of Delia Smith’s ‘cheat’ ingredients, but please don’t let that put you off. Putting the dish together is very easy. Fry the meat for five minutes or so in a medium hot pan with a big glug of oil until it starts to brown and singe at the edges. Add a finely chopped onion and the chopped stalks from a small bunch of coriander to the pan and continue to stir and cook for another five minutes before adding a drained can of chickpeas and a can of chopped tomatoes, along with 400ml of vegetable stock or water. Bring it all to the boil, cover and reduce the heat to a gentle bubble. Leave for an hour and a half. Next, add a smallish squash – a butternut squash will be fine – peeled, the flesh chopped into big chunks. Also add 100g of prunes, each one cut in half. Top the pan up with another 400ml of stock or water, cover and leave for another hour and a half. Keep an eye on the pot and top up with a little more water if it starts to look too dry. If, after the cooking time is up, the sauce is too thin, turn the heat up and reduce, uncovered, for a few minutes. Check the seasoning and test the beef to see that it’s tender to the point of disintegrating. Serve with some chopped coriander leaves and a few sliced, toasted almonds over the top, some flatbreads or plain couscous on the side. This looks so good. I really love Jamie Oliver's recipes! Very nice photo as well. I absolutely love these flavors – thanks for another inspiration. Sounds wonderful! I think I'll be making my way over to a specialty spice store soon! Wow – the photo makes me want to ditch my carefully prepared menu for next week! And your description was so fabulous I felt like it could smell the tangine cooking! Looks so good!!! Makes me want to skip breakfast and rush to dinner!. Delightfully delicious looking, good thing I am heading to the supermarket tonight because I do not think I can pass this up. "Cheat ingredients"??? I guess I don't know about that list but sometimes those types of ingredients are just necessary. I would guess that 5-spice powder is a cheat ingredient too then, eh? 🙂 Your tagine looks amazing. I can't wait to try it! Ah, there's a story behind the 'cheat ingredients'. A few years ago, the TV cook Delia Smith had a series where she cut every corner humanly possible by recommending the use of certain ingredients, ras el hanout amongst them. At the time, I thought it was rubbish, and I still do. Ras el hanout is far from a cheat…yes, you can use it to spice things up a bit, but that's why it exists, so why is that cheating? This looks delicious! I am so excited to make it, though I will probably opt for lamb. Great post. Thanks for the recipe! I love Moroccan flavors. I remember salivating while Jamie made this on TV. Moroccan food is one of my all time favourites, and this looks amazing! This looks like a perfect dish for summer in San Francisco! brilliant stuff and Congrats on the Top 9! 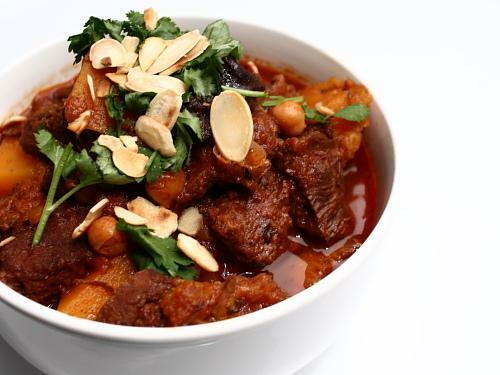 Nice write-up on the background of Moroccan food and your beef tangine looks very delicious. That really was the best meal I have ever made!! I did cheat a bit by using a mulled wine spice bag in addition to liberal helpings of the other spices. I also used the other half of my large tin of chick peas to make some fresh houmous to have with some toasted pitta bread slices. But all the same thank you for helping me win the multitude of brownie points I got for dishing this one up for my beloved!!!!! Fantastic. Glad you enjoyed it. just have this bubbling away on the stove as I write this…it smells gooood, and verrrrry spicy. Only 1.5 hours to go….